This once-in-a-lifetime photo workshop will take place on Costa Rica’s beautiful Osa Peninsula, a location National Geographic calls, “The most biologically intense place on Earth.” An impressive claim, but just a few hours on site is enough to make a believer out of any skeptic. What can you see and photograph? Although there are never any guarantees with wildlife, it’s very likely you’ll see quite a few of the species listed below – heck, you may see them all and then some! In fact, the Osa Peninsula harbors 2.5% of the biodiversity on the planet, even though it only covers less than 1/1000th of 1% of the surface area of the earth! There are over 463 species of birds and 140 species of mammals – think of it as Disneyland for wildlife photographers! Here’s a short list of some of the more common species you’re likely to encounter. And that’s just a taste – you never know what you’ll see! As for the workshop itself, the goal is twofold. First, I want YOU to fill your memory cards with as many incredible shots as possible in the time we have and I will do everything in my power to make that happen. Second, I want to teach you as much as I can about wildlife photography. As a dedicated wildlife photographer, more than 90% of the images I capture each year are of wildlife. I’m a specialist, and when it comes to getting critters on your memory cards, I have a wealth of tips and tricks up my sleeve that will help you accomplish that goal. Also, and as many of you already know, teaching photography is what I do – just check out my extensive collection of blog posts and videos to get an idea of how I convey myself and my information. In this workshop, I’ll not only help you get the shot, but I’ll also share tips and tricks you can use to capture the special moments of any wildlife encounter. We’ll look at everything from camera and tech settings to creative techniques – it’s the whole package, and I think you’ll really enjoy it. At each wildlife encounter, I’ll be there to guide you and assist in capturing those wall-hangers! Also, while I may take a shot here and there, during the workshop, I’m NOT there for my own photos, but for YOUR photos. I’ve heard of nightmare workshops where the instructor was more interested in his or her own photos than that of the participants – that is NOT the case here. YOUR images are the priority for everyone involved. In addition, we’ll also have professional guides along to help locate wildlife – and let me tell you, their ability to find wildlife borders on the supernatural (you’ll see for yourself that last line isn’t just marketing hype). I pride myself on my ability to spot wildlife, but these guys put me to shame. They know the area and can consistently locate and hone in on wildlife of all sorts. Plus, they are super-knowledgeable about every aspect of the rainforest; from fauna to flora, they can tell you all about it. Oh, and they are a blast to hang out with – you’re gonna love ‘em! Finally, our home base will be Crocodile Bay Resort – and it’s just fantastic! The property itself is beautiful, and the truth is, you can (and do) see just about every animal I mentioned on the list above. Some of my best shots were captured right there at the resort, and some of our shooting will take place there. Heck, on our last morning there I was shooting howler monkeys that were less than 20 feet from my bathroom window. (In fact, I was slightly concerned they might try to join me!) Plus, the staff there is jaw-droppingly outstanding. Everyone is super-friendly and always makes you feel welcome. I wish all resorts were this good! On the first day, you’ll fly into San Jose, Costa Rica (most flights arrive in the late afternoon or evening) and enjoy a night at the beautiful Double Tree hotel. It’s an incredible facility and gives you the perfect opportunity to sit back, relax, hang out by the pool, and get a good night’s sleep. We’ll meet you at the lobby and get you checked in right away. Once your gear is dropped off, we hit the conference center where I’ll have a presentation that covers how to photograph the wildlife of Costa Rica. 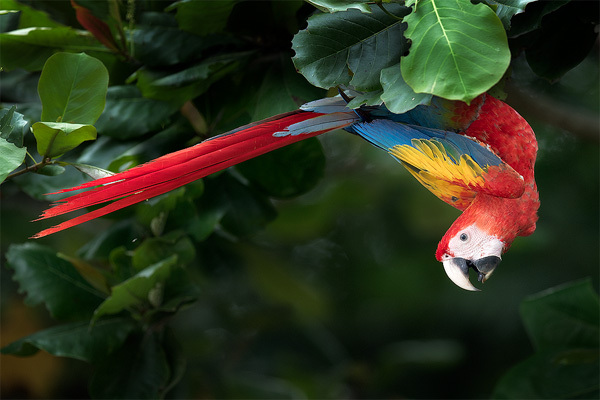 Wildlife photography in Costa Rica can be a challenge and I want you to be thoroughly prepared when the action starts unfolding in your viewfinder. When the amazing moments happen, I want you to know EXACTLY what to do to secure the shot. After all, you don’t want to miss an incredible photo because you weren’t fully instructed beforehand! After the presentation, it’s time for a delicious lunch and then an afternoon photo walk so you can become comfortable with the new techniques discussed in the presentation. Today we’ll head out to the countryside first thing in the morning and discover some incredible wildlife with our expert guides. We’ll enjoy traveling in a set of 4WD vehicles that can get us everywhere we need to go. Throughout the day, we’ll be driving through different locations and stopping along the way when we see interesting wildlife (some days, it’s so active we stop every 10 to 15 minutes). There’s no telling what we’ll see on a given day, but the diversity is incredible. Today we’re up bright and early again and off to one of my favorite locations where we’ll discover even more wildlife! You’ll have the opportunity to photograph a variety of snakes (wild snakes that are in the hands of a professional handler and released when we’re done), various frogs (possibly even poison dart frogs), and a large variety of birds as well. It’s at the top of a mountain overlook and the variety will keep your shutter snapping the entire time. I captured some of my favorite images in this location and it’s by far one of my favorite spots! On day 6 we’re back at it again starting at the Osa Interactive Gardens where we’ll discover abundant macro possibilities along with potential bird and mammal opportunities. This site is mostly colorful frogs, lizards, and insects (especially butterflies), but you never know what you’ll discover! From there, it’s back to the resort for a delicious lunch and then back out on the road for more! In the afternoon, we’ll hunt for monkeys, birds, and anything else we can discover along the way. Bring extra memory cards!! We top off our last full day of shooting with a 3 hour boat tour on the Sierpe river. We embark on a pair of pontoon boats and slowly glide down the river, constantly stopping for the wildlife we discover along the way. The shoreline is loaded with critters and the shutters fly constantly! The wildlife along the river is accustomed to the boat traffic and often allows an incredibly close approach. You’ll want extra memory cards for this day! You’ll be up bright an early today for your flight back to San Jose and than home. Your flights from home to San Jose and from San Jose back home. Any emergency services, if necessary. (There has never been an evacuation in the history of the resort, rest easy). Any meals you decide to have outside of the resort. Can my spouse / family member come and stay at the resort? Yes. For an additional $1200 your spouse or family member can share your accommodations throughout the workshop, however, they will not be able to join you on any workshop activities. That said, keep in mind there are tons of other activities at the resort, or they can just kick back and relax while you’re participating in the workshop. How many participants are in the workshop? In order to give you the best experience possible, we’re limiting the number of participants to just 10 people. Booking will be done on a first come, first serve basis – nothing is hold unless a deposit has been placed. The weather in Costa Rica is hot and humid. Like really hot and humid. Like, Florida in July, only hotter and more humid. And it likes to rain at least once a day. So, I recommend avoiding anything cotton – it just won’t dry and it will feel hot and icky (that’s the technical term BTW). I like dry-fit style shirts (I have some from Eddie Bauer that work well) and shorts (Columbia makes some nice options with their “Omni Wick” and “Quick Dry” water shorts). You can wear long pants if you like, however, make sure they are of the lightweight and fast drying variety. What should I bring for photo gear? Keep in mind this is a dedicated wildlife trip, so you’ll definitely want your big glass. Using full frame, you’ll want at least 300mm, however, I HIGHLY recommend 400mm ~ 500mm or more. One of the super zooms is a good choice like the Nikon 200-500, Sigma 150-600, Tamron 150-600, or Canon 100-400. If you happen to have a big prime take it – I was hesitant to bring my 600mm F4 and ended up using it quite a bit on my last trip. I also HIGHLY recommend a macro lens – we’re going after quite a bit of wildlife that’s anywhere from dime to dollar size. Stick with a focal length of 100mm or longer. (Note – in a pinch you can certainly get by with most super zooms for macro work). In addition, we’ll be doing some night photography, so a dedicated flash unit will be handy as well. Plus, there will likely be times you’ll want to use a bit of fill flash (I’ll show you how to do it). I also highly recommend taking a short zoom for snapshots and it’s always possible a good landscape opportunity will crop up. Something like a 24-70 would be just fine. Since it can be rainy at times, you also may want some sort of “rain jacket” for your gear (or at least borrow a towel from your hotel room). In addition, you’ll likely want a tripod and monopod (I used both quite a bit, but you can probably get by with just one or the other). When it comes to cameras, you’ll want as new of a DSLR as you can muster, preferably something from the last 3~4 years. We end up in a lot of tricky lighting scenarios, often requiring good dynamic range and good high ISO. So, the newer, the better. Any current Nikon or Canon is just fine. Oh, and don’t forget extra memory cards and batteries! What type of non-photography gear should I take? You’ll want your laptop / card reader for sure – we take a TON of photos and you’ll want to offload them at night. I’d also recommend an additional backup device, such as an external hard drive or large memory card (I use a large SD card for backup and keep it on my person at all times). Not at all. I know about a dozen words in Spanish and I got along just fine. Everyone you will deal with speaks English. Absolutely. Everyone is super friendly and never once did we feel “unsafe” in any way. Is there a lot of hiking? No, not on this workshop. Most of our photography is done near the vehicles, with some walking at the resort. Nothing too strenuous in any case. Is the area packed with tourists? Nope, not at all. Sure, there are visitors there, but I was amazed at just how few tourists were in the area. It’s one of the reasons I wanted to go to this location – no “competition” for critters! Will there be opportunities other than wildlife? We’re going to be down there at the end of their summer, so it’s hot but not as bad as it gets from Dec-April. Still, expect hot and humid conditions with rain likely. The good news is that we will likely have a good bit of overcast that will allow us to shoot all day in decent light. Is any of this subject to change? Yes – but it’s not likely. We may choose to rearrange / modify the schedule based on weather or unforeseen circumstances. I don’t see that happening, but if we get a day of solid, heavy rain we may shift things around a bit as needed. The primary goal is for YOU to get as many great images as possible, and any schedule change will be based on meeting that goal. Sign up below for more information on these exclusive photography workshops.